The opening round of group matches in the UEFA Champions League were completed on Wednesday with a shock in Milan, predicted wins for the likes of FC Bayern and Real Madrid proving true whereas the Manchester duo of City and United had to be content with a point in two difficult matches. Ondřej Čelůstka proved to be the hero in the San Siro stadium as his 76th minute goal proved to be the winner in a 1-0 victory over 2009-10 Champions League winners Internazionale. The Turkish side can find themselves fortunate to be in the competition following Fenerbahçe’s expulsion from the competition but they have taken advantage of their reprieve in fine style. The Italians now find themselves under pressure already after an opening day loss in Serie A at the weekend has been coupled with defeat on home soil tonight. In the other Group B match French champions Lille OSC were just moments away from victory but were punished by CSKA Moscow’s Seydou Doumbia whose brace allowed the Russian side a share of the spoils in a 2-2 draw in northern France. Real Madrid, hoping to win a tenth European Cup this season, have started this season’s campaign with a win but were made to work hard by Croatian champions Dinamo Zagreb. The only goal of the game was scored by Ángel di María in the 53rd minute of the match but it far from easy for the Spanish giants who were made to play the final seventeen minutes with ten men following Marcelo’s sending off for a second bookable offence. Real Madrid top Group D as the other two teams in the group, Ajax Amsterdam and Olympique Lyonnais, played out a goalless stalemate in the Dutch capital. FC Bayern München have high hopes in this year’s competition especially given the fact that this season’s final will take place in their home Allianz Arena stadium. It was fitting, therefore, that they should start off the current campaign in fine mood with a 2-0 win away at Spanish side Villarreal CF proving to be light work as Toni Kroos and Rafinha proved to be the unlikely goal scorers helping them on their way to three points in this Group A fixture. The other tie in the group saw Manchester City make their first appearance in European football’s top competition since 1968-69 but had to come from behind to gain a point against Italian side Napoli in a 1-1 draw which saw Aleksandr Kolorov cancel out Edison Cavani’s opener. Last season’s defeated finalists Manchester United also had to settle for a point but would’ve been more satisfied to do so than their city neighbours were in Manchester. United had to travel to Portuguese giants SL Benfica in a match which had all the history and tradition of the 1967-68 final behind it. The home side took the lead after 24 minutes thanks to Óscar Cardozo’s but an old campaigner in Ryan Giggs got United back on level terms just three minutes before half-time and the score line didn’t change from there although both sides had chances to win the game in the second half. The loss of two points for both these clubs has allowed Swiss champions FC Basel 1893 to steal a march in Group C as an Alexander Frei penalty in the 84th minute proved to be the winner against tournament debutants Oțelul Galați in a 2-1 triumph. The 2011 AFC Asian Champions League has reached the quarter-final stages with the first legs taking place today. As has been the case in recent years South Korean clubs feature prominently in the last eight of the competition with FC Seoul, Suwon Samsung Bluewings and Jeonbuk Hyundai Motors involved this time. There are also two clubs from Iran (Zob Ahan and Sepahan FC) and one each from Saudi Arabia (Al-Ittihad), Japan (Cerezo Osaka) and Qatar (Al-Sadd) making up this year’s octet of hopefuls. Sole Japanese representatives Cerezo Osaka were involved in a topsy turvy fixture at home to Jeonbuk Hyundai Motors in the game of the day. Lee Dong-Gook scored a brace either side of Ryuji Bando’s 28th minute goal for Cerezo to put the Koreans 2-1 up at half-time. There was no let-up in the action after the break with Cho Sung-Hwan (Jeonbuk) and Hiroshi Kiyotake (Cerezo) trading goals to make it 3-2 to the visitors just before the hour mark. The Japanese side turned the game around in the last third of the game with a penalty from Kim Bo-Kyung and Kiyotake’s second goal sealing a hard fought 4-3 win for Osaka. Suwon Samsung Bluewings, back-to-back champions in this competition in 2001-02, were unable to make home advantage count in their opening leg against last season’s defeated finalists Zob Ahan. The Iranians took the lead after 56 minutes through Mohammed Ghazi but the Bluewings equalized ten minutes later thanks to Park Hyun-Boem and with the score line ending up 1-1 it sets up an interesting return leg in the Iranian city of Isfahan in two weeks time. FC Seoul, last season’s K-League champions, have yet to win the Asian Champions League and following their first leg tie away at Al-Ittihad it may prove difficult for them to win a maiden title. The Saudi Arabian side, who are two-time Asian champions, took the lead on the stroke of half-time with Mohammed Noor putting The Tigers ahead. The Jeddah-based side saw Osama Al Harbi double their lead on 76 minutes only for Seoul’s Kim to pull one back with seven minutes to play. The first leg was settled in stoppage time with Brazilian player Wendel settling matters by helping Al-Ittihad to a third goal and give his side what could be a crucial two goal cushion in the return leg. Finally, in the only game of the round not involving a South Korean club, there was just one goal to separate Sepahan FC and Al Sadd with Omid Ebrahimi’s 12th minute goal deciding the game in the Iranians’ favour. The victory was dampened somewhat by the sending off of Akbar Imani just before the hour mark having picked up his second yellow card of the match. Concerns over FC Barcelona’s defence continued after the first of this season’s UEFA Champions League matches were played throughout Europe last night. The defending Spanish and European champions had home advantage in their Group H encounter against AC Milan but were behind after just 25 seconds with Alexandre Pato scoring the fastest goal ever scored in the competition. The hosts, who lost a two goal lead in a 2-2 draw against Real Sociedad last weekend, had turned it around by early in the second half with Pedro and David Villa getting on the score sheet for the Catalans. As the seconds ticked towards the end the Italian champions, who had also drawn their most recent league match 2-2 against Lazio, won a corner which was turned home by Thiago Silva deep into stoppage time to ensure that the score line would be replicated in this match. Fortunately for them neither of the other teams in their group were able to capitalize as Czech champions Viktoria Plzeň, making their debut in the UEFA Champions League, drew 1-1 at home to Belarussian champions BATE Borisov with Marek Bakoš and Renan Bressan scoring the respective goals. Other Champions League action on Tuesday saw the English come out on top in a double Anglo-German battle. Premier League runners-up Chelsea FC defeated their Bundesliga counterparts Bayer 04 Leverkusen by two goals to nil whilst Arsenal FC were moments away from a famous win against Borussia Dortmund only for Ivan Perišić to score at the death as the German champions salvaged a 1-1 draw in the Group F fixture. Chelsea top Group E with a two point lead over both Racing Genk and Valencia CF, both of whom played out a turgid 0-0 stalemate in Belgium, whilst Olympique de Marseilla took control of group F with a 1-0 win at Greek champions Olympiakos with Lucho González’s goal proving decisive. Group G saw two come-from-behind wins for Portuguese champions FC Porto and Cypriot title holders APOEL Nicosia with both sides coming from a goal down to win 2-1 against Shakhtar Donetsk and Zenit Saint Petersburg respectively. The quarter-final, first leg ties in the AFC Cup, Asian football’s second-tier competition, were played today. The first match of the day saw Iraqi side Arbil Sports Club take a crucial 2-1 lead from Indonesian outfit Persipura Jayapura who had home advantage today but didn’t make the most of it. Nabeel Sabah and Muslim Mubarak were on the score sheet for the Iraqis with Zah Rahan Krangar pulling one back for the hosts with eight minutes of the game remaining. The second game was a contentious affair involving Thailand’s Chonburi FC and Uzbekistan’s Nasaf Quarshi FC, both of whom had a player sent off. The only goal of the game came just three minutes into the second half with Montenegrin forward Ivan Bošković hitting the target and proving to be the difference between the two teams. It proved not to be a particularly great day for Thai clubs as Muangthong United also lost in their match away at Al-Kuwait with Rogerinho’s 76th minute strike separating the two sides with the second leg to be played in a fortnight’s time. The final game of the day came in Jordan where Al-Wehdat overcame the challenge of Iraqis Duhok SC with Mahmoud Shelbaieh’s hat-trick in the last ten minutes of the game giving the home side a comfortable advantage to take into the return fixture. European football’s governing body UEFA has decided against allowing Swiss club FC Sion back into the 2011-12 UEFA Europa League, thus maintaining Glasgow Celtic’s place in Group I of the competition which begins this Thursday. FC Sion qualified for this season’s competition following an aggregate victory against the Scottish giants in the Play-Off round but were subsequently expelled following a protest from the Parkhead club who claimed that a number of the Swiss club’s players were ineligible. FC Sion, last season’s Swiss Cup winners, lodged an appeal through a civil court case in Switzerland which found in the club’s favour. However the Swiss court’s judgement has had no impact upon UEFA’s final decision and means that Celtic can finally look forward to the opening game of the group stages against 2009-10 UEFA Europa League winners Atlético Madrid to be played in the Spanish capital on Thursday. FC Sion, meanwhile, are considering further action and could take the case to the Court of Arbitration for Sport. 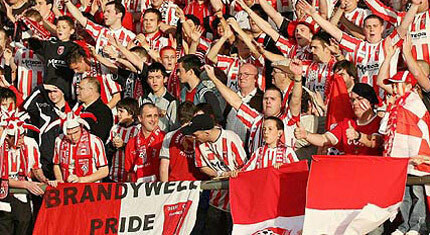 Will Derry City fans have something to celebrate this season? The title race in the Airtricity League in the Republic of Ireland is reaching a critical stage and looks set to go down to the wire with up to five teams still holding title ambitions. Derry City (59 points, 30 games) have experienced many difficulties over the last few years but the club is playing well again following their promotion from the First Division (2nd tier) last season. Their title efforts were thwarted slightly last night however, only managing to pick up a point in a 2-2 draw at home to second bottom side Drogheda United, but the point gained provided a little daylight between themselves and the two immediate chasing teams of Sligo Rovers (3-0 winners at home to Bray Wanderers) and Shamrock Rovers (who drew 1-1 with fourth place St Patrick’s Athletic) both of whom have 58 points. Shamrock Rovers, however, will face a very tough end to the season; not only do they have a game in hand in the domestic league and an Irish Cup quarter-final to look forward to but Rovers will also face a major distraction in the form of UEFA Europa League football which begins this week with a home tie against two-time Russian champions Rubin Kazan. Saint Patrick’s Athletic’s ability to pick up a point against the title favourites has given them hope of a late push as they lie just four points behind Shamrock Rovers. Bohemians Dublin have given themselves an outside chance having won their last three matches in a row. They lie in fifth position with 51 points from 29 games following their Monday night 3-1 win at home to Dundalk but they have arguably the toughest run-in of all of the top sides as they have to face off against Shamrock Rovers, Sligo Rovers and Derry City in their last three games. 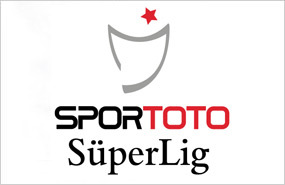 The Turkish Süper Lig has finally got under way over the last weekend following extensive investigations into match-fixing. Last season’s champions Fenerbahçe scraped a 1-0 home win against Ordurspor last night whilst both of their arch-rivals Beşiktaş and Galatasaray experienced losing starts to the campaign going down to Eskişehirspor and Istanbul BB respectively. Fenerbahçe got their new campaign under way at their Şükrü Saracoğlu stadium last night with the remnants of the match-fixing investigations and their expulsion from the 2011-12 UEFA Champions League still hanging over the club. Despite this the champions were still expected to score plenty of goals against Odurspor who were promoted last season via the 1.Lig Play-Offs following their 5th place finish. Fenerbahçe never really got firing in front of goal but were still able to come through this opening day tie with all three points with Cristian’s goal on the half-hour mark helping Fener to a winning start. Bursaspor, champions of Turkey for the first time in 2009-10, were the biggest winners of the weekend with a 3-0 home triumph against Kayserispor thanks to strikes from Ozan Ipek, Vederson and Pablo Batalla. Beşiktaş and Galatasaray, on the other hand, suffered defeats over the weekend. Beşiktaş went behind in their game to Eskişehirspor after Diego Ângelo had given the hosts the lead on 25 minutes only for Hugo Almeida to restore parity on the stroke of half-time. Batuhan Karadeniz scored the decisive goal for Eskişehirspor with seven minutes to play and subject Beşiktaş to an opening day defeat for the first time in five seasons. Galatasaray suffered a 2-0 loss in a local derby with Istanbul BB on Sunday with goals from Efe İnanç and Pierre Webo helping the home side to victory over a Gala side which had been very active in the transfer market during the off-season and had hoped to start the new season on a positive note. Last season’s runners-up Trabzonspor may not have experienced defeat this weekend but were still disappointed not to come away with three points from their match away at Manisaspor especially as the hosts had to come from behind to gain the point. Canadian international Josh Simpson equalized for Manisaspor with just two minutes of the game remaining which cancelled out Burak Yilmaz’s first half strike for Trabzonspor. Saudi Arabia’s domestic championship began this weekend with record champions Al-Hilal showing their mettle as they came from behind to defeat Hajer Club by two goals to one whilst Al-Ittihad warmed up for their forthcoming AFC Champions League clash with South Korean outfit FC Seoul with an exciting 5-3 triumph over Al Tawwun. Al-Hilal won last season’s title going through the whole league campaign undefeated but when Hajer Club took the lead through Khalid Al-Rujaib on the stroke of half-time there was a worry that the opening to the new season would finish in an embarrassing defeat to a team who were promoted as First Division (2nd tier) champions last season. The old order was restored when Youssef Al-Arabi scored the equalizer just five minutes after the break with Al-Hilal, under the charge of new coach ex-Germany international Thomas Doll, able to take control of the situation midway through the second half when Al-Arabi scored his second of the game and give the champions a lead which they never relinquished. Al-Ittihad have finished second in the league for the last two seasons because of the superior form of their arch-rivals from Al-Hilal. However they began the new campaign with a 5-3 win over Al-Tawwun who finished the 2010-11 season in a respectable 7th place. Last season’s runners-up seemed to be coasting to victory going in with a 3-1 half-time lead but Al-Tawwun came back to level the scores with just fifteen minutes of the match remaining. However goals from Wendel and Fahad Al-Enezi provided Al-Ittihad with the cushion they were looking for and provided a much needed confidence boost ahead of their quarter-final, 1st leg fixture against FC Seoul in the AFC Champions League this Wednesday. With just one matchday to play in the group stage of the CAF African Champions League only Nigerian champions Enyimba FC have secured a place in the semi-finals. Five teams kept alive their ambitions of progression into the final four of this year’s competition and thus ensure an interesting finish to this stage of the tournament next weekend. A similar situation prevaisl in the second-tier CAF Confederation Cup with only Angolan outfit Inter Luanda guaranteed a semi-final place as it stands after Matchday 5. A stoppage time goal from Samuel Tswanya gave Enyimba FC a 2-1 win away at Sudanese champions Al-Hilal Omdurmam and provided the Nigerians with a four point cushion at the top of the table with just one match to play in Group A. Osmaila Baiba bagged two goals as his Coton Sport side came from behind to beat Moroccans Raja Casablanca by two goals to one. 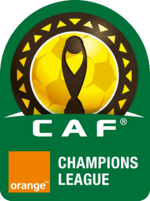 Coton Sport are in joint second place with Al-Hilal on seven points and both teams must travel on the final matchday to Enyimba FC and Raja Casablanca respectively. Group B still remains very open with only MC Alger completely out of the running for a semi-final spot. Espérance ST hammered MC Alger by four goals to nil on Saturday with Yannick N’Djeng scoring a hat-trick for the Tunisian champions to ensure that they top the group with nine points from five games going into the last match of the group stage next weekend. A win for Wydad Casablanca yesterday would’ve guaranteed them a semi-final spot but they fluffed their opportunity at home to record African champions Al Ahly with the teams having to be satisfied with a point each following a 1-1 draw. Wydad will still fancy their chances of progression as they travel to MC Alger on Matchday 6 with Egyptian giants Al Ahly hosting Espérance ST on Friday night. Inter Luanda’s 4-1 thrashing of Nigerians Kaduna United means that they guarantee themselves the first semi-final spot of the 2011 CAF Confederation Cup. Club Africain look the most likely to join Inter into the semi-finals from Group A as they have eight points, three more than Kaduna United whom they must face on Matchday 6 hopeful of gaining just a solitary point to qualify. MAS Fez currently top Group B with eleven points and need just a point at home to Congolese side Motema Pembe to be certain of semi-final football. Motema Pembe along with Nigerians Sunshine Stars lie on eight points but the latter seem more likely to progress as they have a home match against JS Kabylie on Matchday 6 with the Algerian side remaining pointless after five games. It was an eventful start to the new Serie A season in Italy with champions AC Milan coming from behind to gain a useful point at home to Lazio whilst local rivals Internazionale were defeated in an amazing game by four goals to three away at Palermo. Juventus were the big winners of the weekend when putting AC Parma to the sword by four goals to one in the first official league match played at their new Juventus Arena stadium. The San Siro saw the first action of the new season on Friday night with new signings Miroslav Klose and Djibril Cissé getting on the score sheet in the first twenty minutes for visiting Lazio. However this spurred the home side into action and it was Zlatan Ibrahimovic and Antonio Cassano who the Rossoneri had to thank for giving them a point with the match eventually finishing in a 2-2 draw. Sunday saw Juventus easily defeat AC Parma with Stephan Lichtsteiner, Simone Pepe, Arturo Vidal and Claudio Marchisio each scoring for the Old Lady in a 4-1 win with Sebastian Giovinco reducing the arrears from the penalty spot for Parma in stoppage time. An amazing game in Palermo saw the hosts defeat Internazionale 4-3 in a topsy-turvy match. Diego Milito gave Inter the lead twice before being pulled back each time by Fabrizio Miccoli and Abel Hernandez. Palermo then took the lead for the first time as late as the 86th minute with Mauricio Panilla scored twice in three minutes to play his part in setting up a famous win for the Sicilians but Inter did pull one back in the dying moments with new signing Diego Forlan maing it 4-3 in stoppage time. There were also opening day wins for Cagliari Calcio (2-1 away at AS Roma), Fiorentina (2-0 v Bologna) and Udinese (2-0 v Lecce) whilst six other teams – Catania, Siena, Chievo, Novara, Genoa and Atalanta – began their season by gaining a point in hard-fought draws.